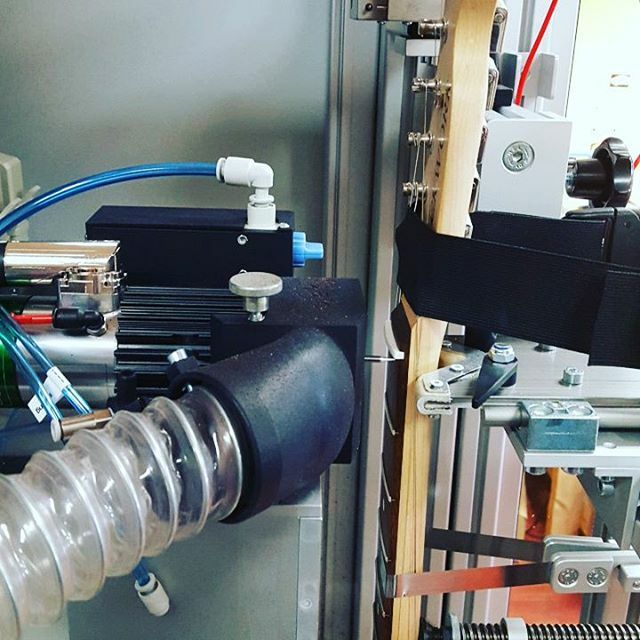 Plek is almost like an MRI machine and a CNC Robot in one. 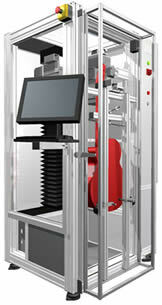 Plek scans your instrument fretboard and strings while tuned up to pitch. It gives us a very detailed look at what is going on and what can be done to make your guitar, bass, etc... play the best it possibly can. This computer controlled device scans instruments under actual playing conditions - strung and tuned to pitch - and performs all functions around that data. This is a major breakthrough, as this work was done manually without strings tuned up in the past. This is much more accurate than a jig that simulates string tension, as well. We had experience with fret dressing and setting up thousands of instruments by hand. With Plek, 13th Street Guitars can deliver even better work than we could ever imagine. We were skeptical of this new technology, like many people are, but once we really came to understand the measurements and processes it's capable of - We are now believers. Plek makes us better than we were, and we were already very good at what we do. We have processed several hundred guitars since getting the machine. The results have been fantastic. We are so spoiled by it, we don't want to play anything that hasn't been Plek'd. Please come down and play some instruments that have been Plek'd to see the difference for yourself! Plek Scan shows how uneven the frets are. The red line is actual fret heights. Green line is the optimum height. 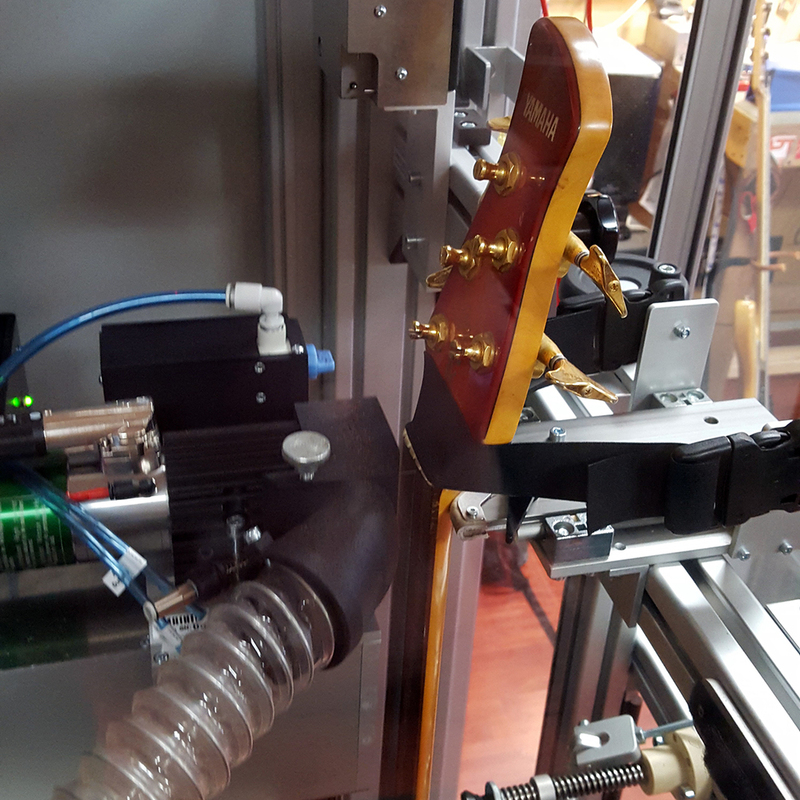 We use a Plek scan to see if the guitar needs the frets dressed, or in less common cases, a partial or complete refret. The plek scan (pictured at right) shows exact fret heights and projects post-dress results. We then perform a "Virtual Fret Dress" which allows us to project exactly what will happen when the frets are cut. In this manner, we can alleviate whatever issues the guitar has, as well as adjust it for the specific style of the player. Each fret dress is tailored to the action we set. String size, scale, nut height, etc... is all taken into account. The frets are adjusted to each string - as larger strings need more relief and skinnier strings require less. A great benefit of the Plek process is that we preserve as much fret as we can. This keeps them at their highest possible level. (or we can lower them if you like) Some techs will grind half the frets off a guitar unnecessarily when performing a fret dress. While some guitars will require that, most do not. It's wasteful and it sends the guitar down the road to refretting much sooner. 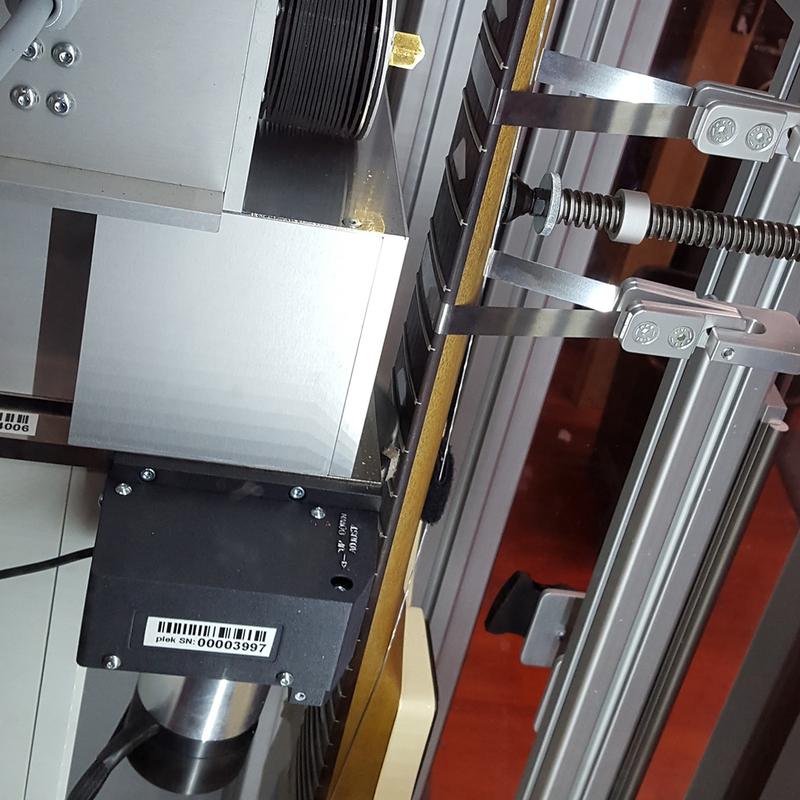 The accuracy of Plek allows us to determine exactly what is required to cut. We have some custom options that we take advantage of on most guitars. We put on just the right amount of fall-away on the higher frets to make it play great. If you look at your last fret and see wear marks on it - but you never play there - the strings are hitting that last fret or two while you're playing lower notes down the neck. Fall-away (or fall-off) helps prevent this by gradually trimming fret heights slightly lower up in the highest notes. This allows more space for the string to swing without contacting and killing sustain. Very low action can be attained with incredible clarity of tone. Another option is compound radius. We can grind a little into the tops of the existing frets on many guitars. Big bends just ring out all the way up. You keep that vintage feel but get shredder-like performance on the high notes. This is an option on many new guitars and necks. We offer this on existing guitars. Once the virtual fret dress is complete, the instrument is prepped in the cradle for processing. The strings are slacked and tucked around the back of the neck. Plek will scan the neck again to see how the shape has changed without string tension on it. Then it will process the frets according to our programming. When this is complete, we tune it back up to pitch for one more scan - just to make sure everything is perfect. Combining this great tool with our skills from thousands of fret dresses and setups makes for some amazing playing guitars. 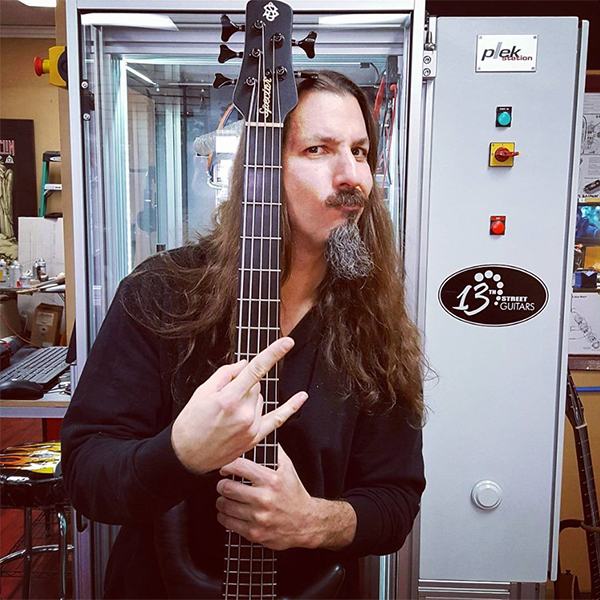 If you want to get a feel for it, come on down and try some of our guitars and basses that have been plek'd right here at 13th Street Guitars. We are also using Plek as an integral part of our refretting process. We remove the frets and actually scan the fretboard itself. Then Plek will cut the perfect shape right into the wood itself. We have been producing a lot of compound radius boards with perfect relief (bow of the neck) and fall-away built right in. After finishing the fretboard shape, we put in the new frets by hand, bevel, dress the fret ends, etc... Next the guitar goes back in the Plek machine. Since the fretboard and the frets get the same custom shape treatment, the maximum amount of fret height can be maintained. This ensures a long life for the new fret job and the absolute best scenario for playability of the guitar. Plek is available for Electric and Acoustic Guitars and Basses as well as many Ukuleles and Mandolins. Plek is awesome for planing fretless bass fingerboards. We can use all the same principles that go into the fret work but cut it into the board. We've produced many incredibly great playing fretless intruments in this manner. 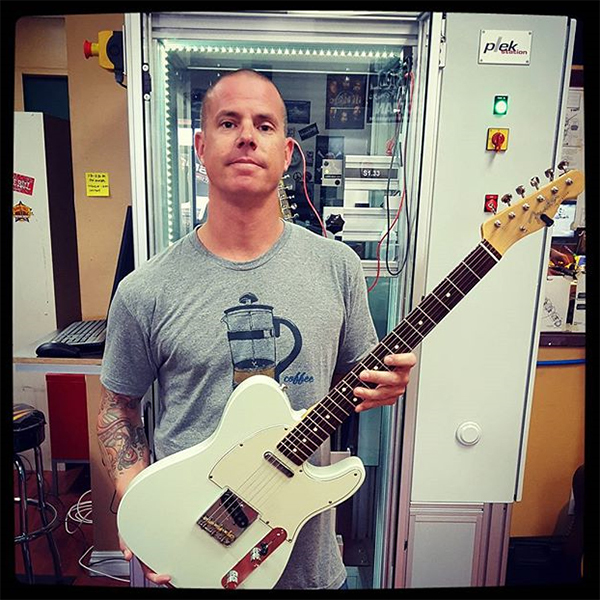 Our Plek Machine Location is in-house at 13th Street Guitars in Huntington Beach, CA. We have clients that drive from all over the southwest for our services. If traveling, please call us to make arrangements. We also accept shipped instruments for repair and Plek work. Many guitars come into the shop that were Plek'd at the factory. We've seen some of these that still have fret issues. This scan pictured above is an example of a very expensive guitar from a major manufacturer. It has high frets in prime playing areas. The customer complained of it being buzzy and some notes hardly ringing at all. (mostly on the 4th fret, where the 5th fret is so high the string is hitting it) So while this guitar was Plek'd at the factory, it unfortunately needs more fret work. A Plek job is only as good as the technician who does the job. We are experts at fret work. You won't have this problem with us. Are you a custom guitar builder and would like to use Plek on instruments you will be reselling? It costs an awful lot of money to buy a machine, so many boutique builders can't justify the cost. 13th Street Guitars can help you with that. We have the Plek Station and are willing to do piece-work to provide your guitars or basses with the services you want. Contact us for pricing and project inquiries. We're happy to work with you. Bring in your instrument to see what we can do for you! this entire website is for informational purposes - we are not responsible for any typos - I'm a lot better at fixing guitars than making websites.